I have read the paper ：Discovering Deviating Cases and Process Variants Using Trace Clustering,and I want to use it export the sublogs,but when I use it in prom,it only output a diagram that has a lot of circles. When you click on a cluster (represented by a circle), the right-hand parts of the screen should show you the option to export the cases in the selected cluster to the ProM workspace as a new event log. From there you can export it or use it as input for other plug-ins. You can also select multiple clusters by dragging an area or by holding the shift or ctrl keys. I notice that only choose picking mode can it works. This is why I could not export them before. And how can I choose the better "cluster dimensions"? 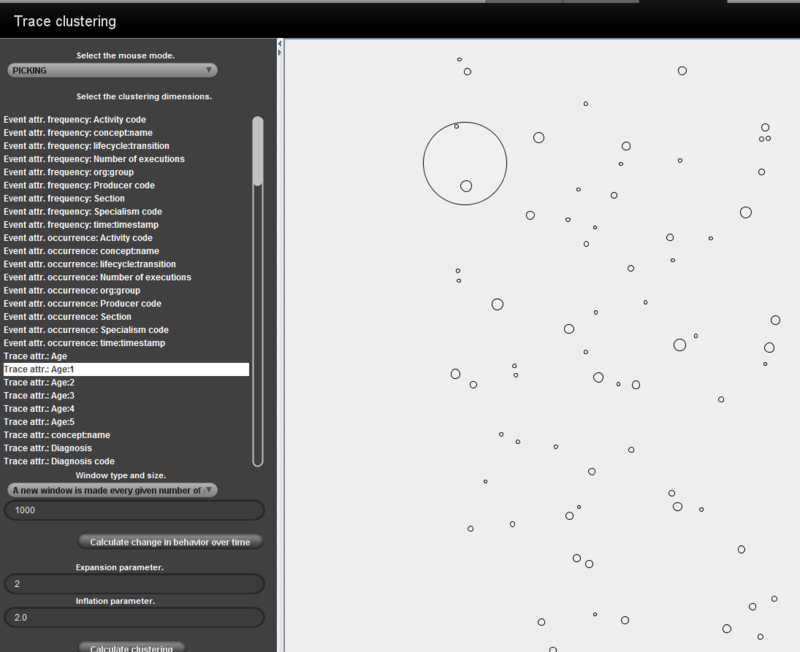 Can prom secondary clustering data？Cause the result contains too many clusters.I want to reduce the number of clusters. Nice to hear you were able to solve the problem regarding exporting clusters as event logs. 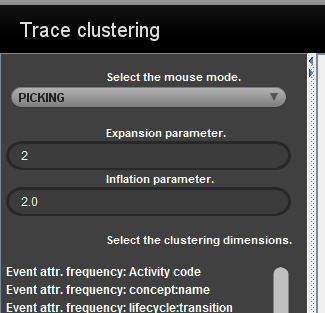 - What clustering dimensions you use determine what aspects will be considered to compute similarity between traces. As such, the things you want to cluster upon should be selected as dimensions. 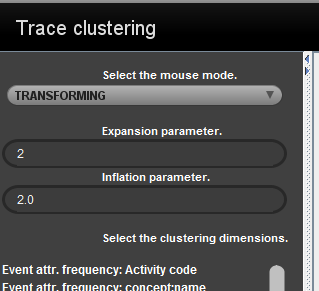 - To reduce the number of clusters you can play around with the expansion and inflation parameters of the MCL algorithm. You will find more information on both points in the paper and on related topics on this forum. Now I understand the concepts.But I noticed that when I deal with large files,the plug-in always become very slow. Can I use this plug-in generate fixed number of clusters?Through using the two parameters .